I like to wear scarves. With colder weather, I am often digging into my scarf wardrobe and finding some old friends I haven’t seen since last winter. 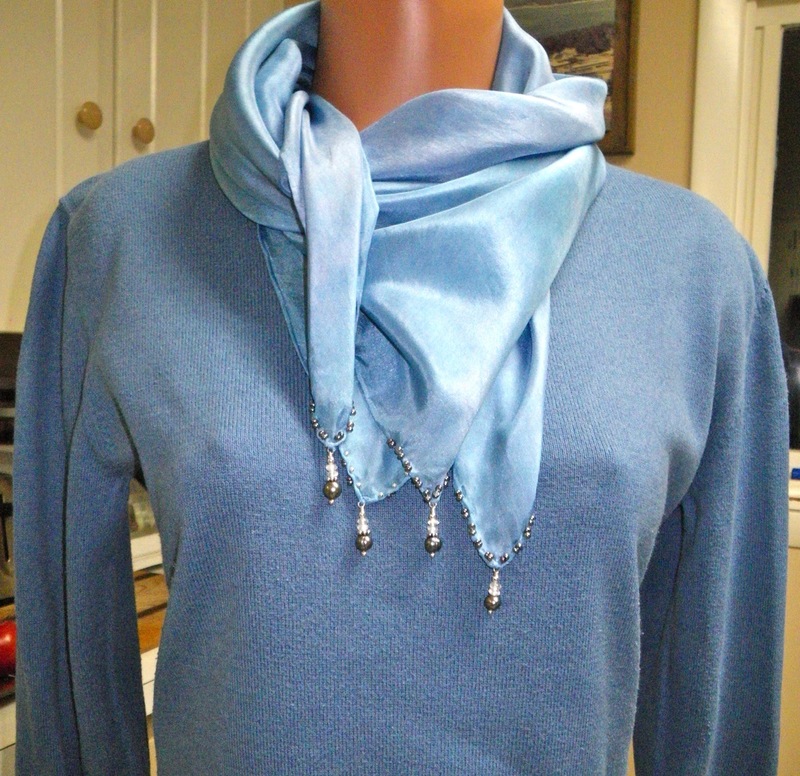 I have several large squares that I like to just fold in half on the diagonal and drape around my neck without getting too fussy about tying them. 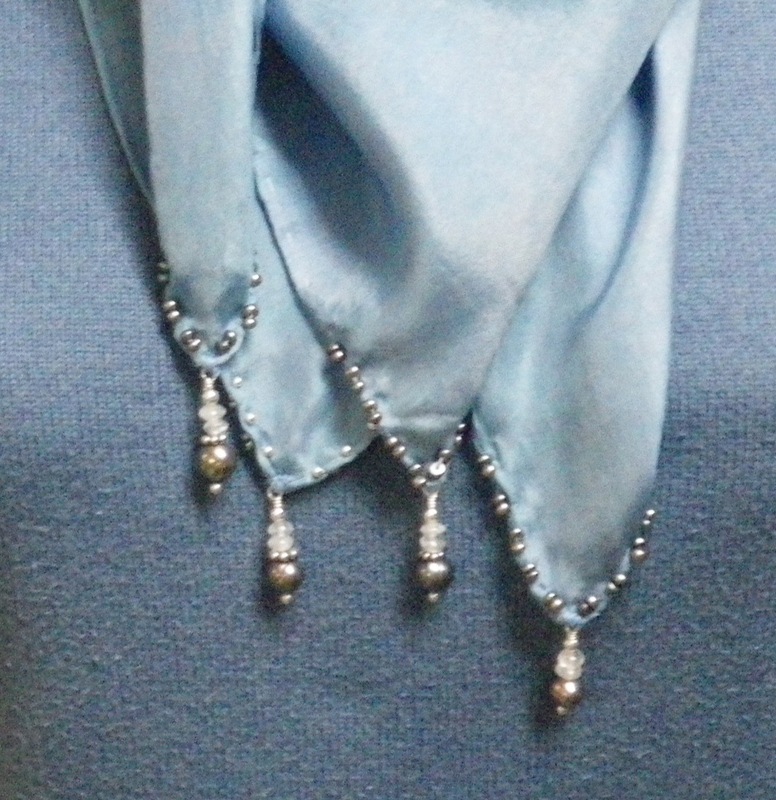 I started thinking before Christmas, that it might be fun to add beads to the corners of these scarves to give them just that little bit of weight to hang easily and effectively without being tied. 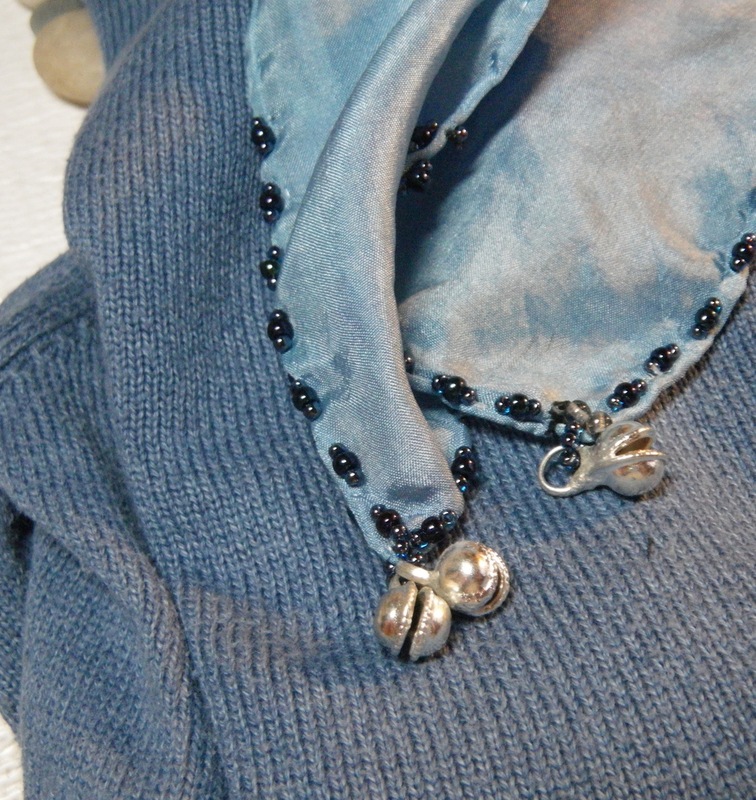 After a stupid morning, where I had trouble getting out of my own way, I thought, “Well, I’ll just go find that blue scarf, find some beads that work with the color and sew them on before lunch. I can then take some photos and have a little blog post written before dinner.” It sounded so easy. I knew I wanted weight at the corners, but that’s about all I knew. 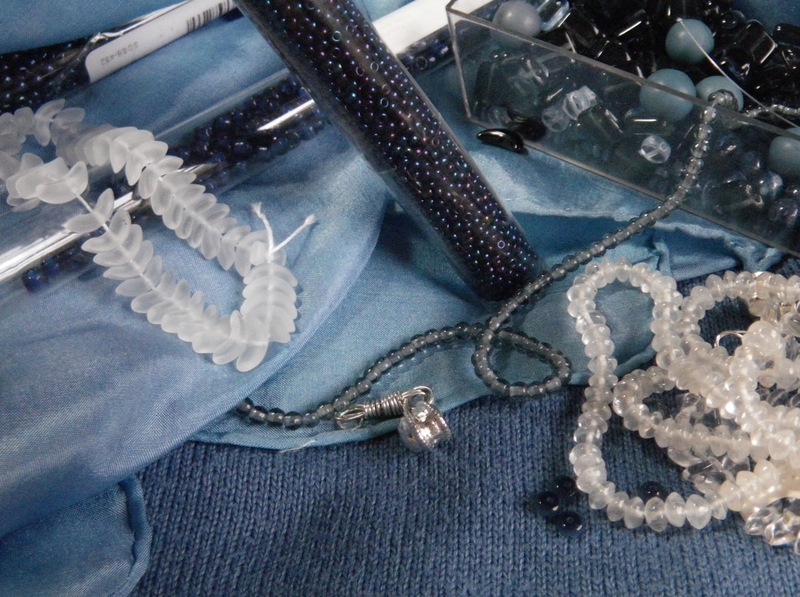 I’ve strung thousands of beads on necklaces, but have never sewn one on to anything. My first attempt was kind of gaumy. I tried the beads in opposite corners, then ripped them out when I didn’t like how they looked or how they hung. It was actually starting to get to me, how long the whole “little” project was taking, as I tried various combinations and then ripped them out. I finally ended up, (after dinner!) 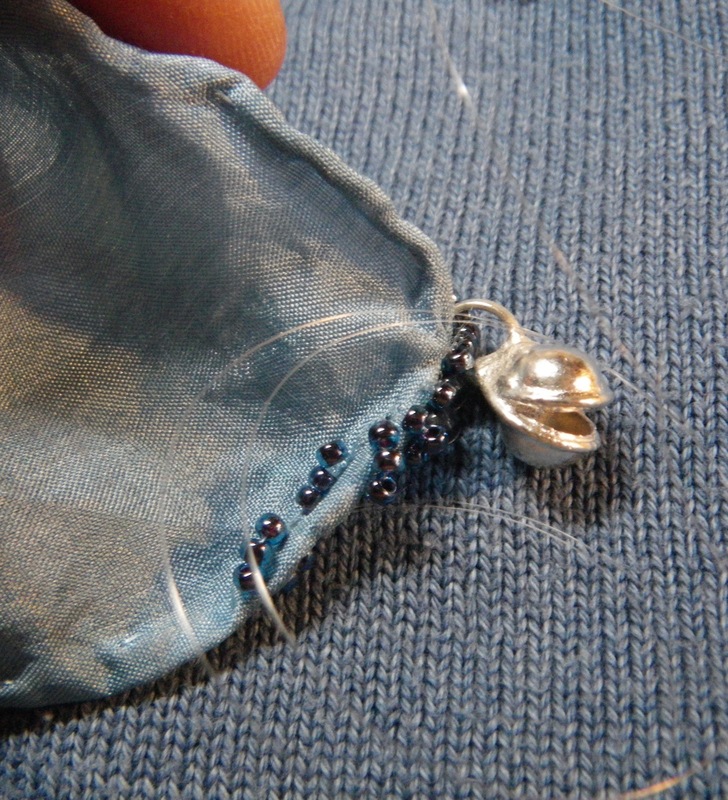 adding 4 beaded wire dangles that I sewed in place with a few extra fresh water pearls sewn on either side. I’m not sure I like the final look, but it hangs the way I had imagined. This is a project I didn’t like, and would have abandoned if it weren’t for my challenge to myself to blog every day. It was my planned post for the day. I’ll wear the scarf at least once to see how I like it and to see if it’s a project to repeat with any of my other scarves. Meanwhile, I love this little youtube video about tying scarves. It makes me realize I need to upgrade my blog page to be able to include videos rather than just posting a link. Enjoy! Best laid plans of mice and men or something like that. I have little ‘easy’ projects spin out of control quite often. I like the result and this is such a good idea to add that little bit of weight to the corners. I think it is quite lovely! It really jazzed up the scarf. Nice work even if it did take you longer than expected. I like how it looks Barb!